The Boxing Mad Heavy Duty PVC Punch Bag - 120cm x 30cm is a 2.5mm leather grain vinyl bag which is machine filled with a custom blend for optimum weight and feel. 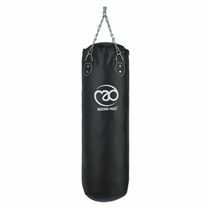 This durable punch bag features a zip closing top with four heavy gauge welded “D” rings and comes with welded chains with swivel hook. for submitting product information about Boxing Mad Heavy Duty PVC Punch Bag - 120cm x 30cm We aim to answer all questions within 2-3 days. for submitting product information about Boxing Mad Heavy Duty PVC Punch Bag - 120cm x 30cm. We aim to answer all questions within 2-3 days. If you provided your name and email address, we will email you as soon as the answer is published. for submitting product review about Boxing Mad Heavy Duty PVC Punch Bag - 120cm x 30cm.